Angry youths have clashed with riot police in the eastern Paris suburb of Bagnolet after a young motorcyclist died fleeing police on Sunday. Police said the 18-year-old died after crashing into a metal barrier, but locals said he was hit by a police car. Demonstrators hurled stones at police and torched several vehicles. 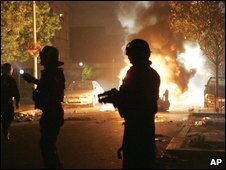 The violence came despite an appeal for calm by French Interior Minister Brice Hortefeux, who ordered an internal police investigation into the death. The administrative centre of the region, just east of Paris, said the situation was under control despite the scattered arson attacks. Arrests had been made, it said, without specifying how many. On Sunday night, dozens of youths hurled petrol bombs at police and torched dozens of cars in outrage at the young pizza delivery man's death.